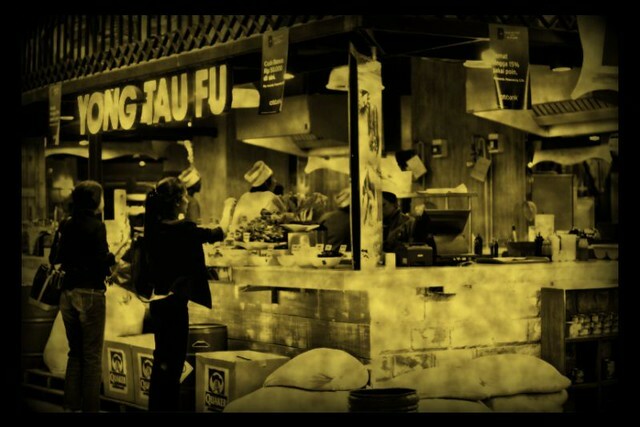 Javanese Food Stall for Black & White Wednesday hosted by Susan from The Well-Seasoned Cook. 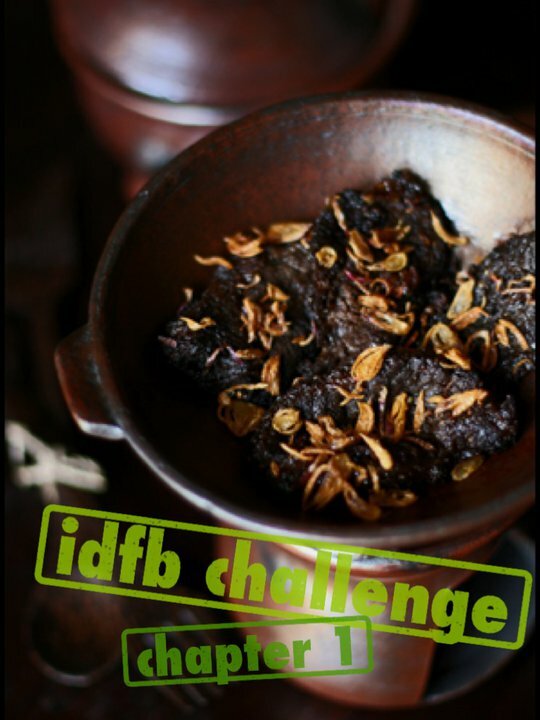 I submitted this recipe as an entry on Food by its country by Indonesian Foodblogger Group. Another fish cake recipe from me, but this one is grilled one (I've posted a recipe of fried Indonesian fish cake here). Indonesia as a maritime country has so many varieties of recipe with fish as the main ingredient. Some regions also have their own specialties. Palembang famous with pempek, kemplang (fish cracker) and otak-otak and Makassar is best known for its fresh seafood especially barbequed fish. Indonesia, Malaysia and Singapore are some countries where you could find the street vendor of grilled otak-otak easily. Otak-otak panggang or grilled otak-otak is very addictive. 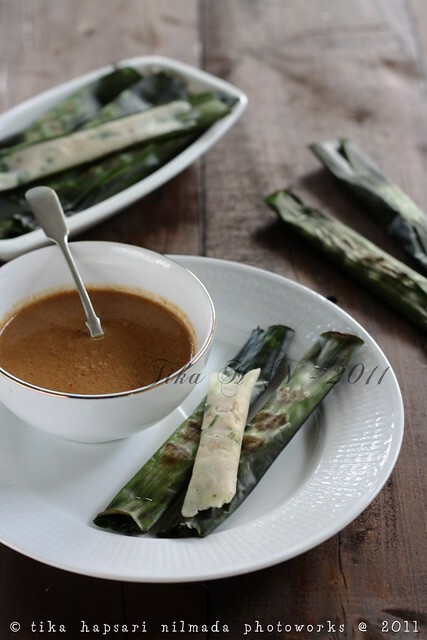 With peanut dipping sauce as a perfect accompaniment to grilled otak-otak. One is never enough !! Like any other weekend, when I stay at home I take time to cook something I haven't cooked before. Wake up early in the morning and feel enthusiastic with the weekend project. Clean up the house, go to the market (I love traditional market !) and cook ! It will be complete when the house is clean, food is ready to be served, we eat together and my family enjoy the food. Plus a big smile on their faces as a bonus. Yes....this is what I call refreshing on my weekend. 1. Fish cake : grind shallots, garlic and white pepper to a fine paste. Set aside. In a mixing bowl, add in fish, salt and egg white. Mix well. 2. Add grounded shallots, garlic, white pepper and sugar. 3. Pour coconut, beat the mixture until smooth. Add mung bean starch and onion leaf. Mix well. 4. Rub some oil in the inner side of banana leaf before placing the fish mixture. Place about 20 gr of the fish mixture, fold and secure it with toothpick. 5. Preheat the grill and place the the fish cake on the grill by flipping them for couple of times until set. 6. 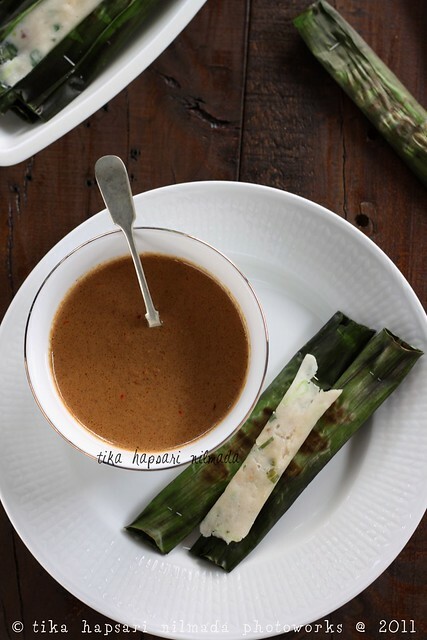 Peanut sauce : blend roasted peanuts and chilies in a blender until smooth. In a medium bowl, place all ingredients. Stir evenly. 7. Serve fish cakes with the sauce. 1. Otak-otak : Aduk rata daging tenggiri, garam dan putih telur. 2. Masukkan bawang merah, bawang putih, merica bubuk dan gula pasir. 3. Tuang santan. Aduk sampai kalis. 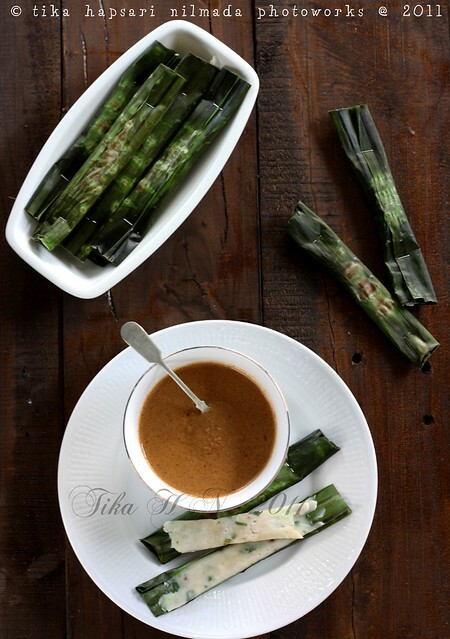 Tambahkan tepung hunkwe dan daun bawang. Aduk rata. 4. Oleskan minyak di bagian dalam daun pisang yang akan diletakkan adonan. Sendokkan 20 gr adonan ke daun pisang. Bungkus. Sematkan lidi. 5. Panggang di atas bara api sambil dibolak-balik sampai matang. 6. Sambal : aduk rata kacang tanah, cabai, garam, gula pasir, air panas dan cuka. 7. Sajikan otak-otak bersama dengan sambalnya. For my birthday last year, my husband bought me a magic pan :). "It would be so useful", he said. The pan has upper and lower plate and it's a nonstick pan too. Martabak brownies was the first recipe I tried using this pan and it worked ! In Indonesia, martabak is very popular as an evening snack. There are two variation of martabak, sweet and savory. The sweet martabak, is Indonesian style thick pancake stuffed with chocolate, cheese, sweet condensed milk and chopped peanut. 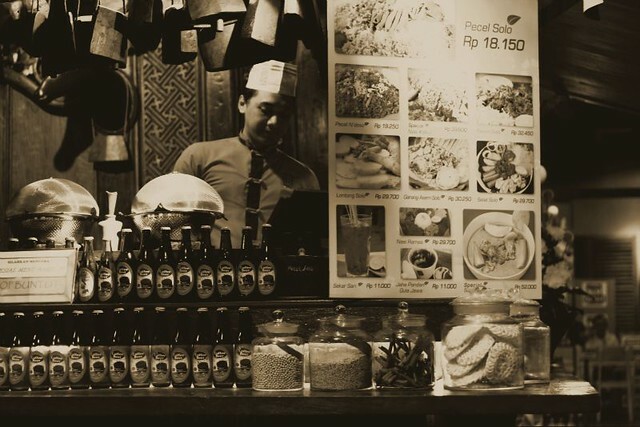 But now, the martabak sellers has offered you variety of toppings and you may also choose your own martabak topping, banana, black sticky rice, shredded coconut, corn, durian, sesame seeds, jack fruit, almond and fruit jams. 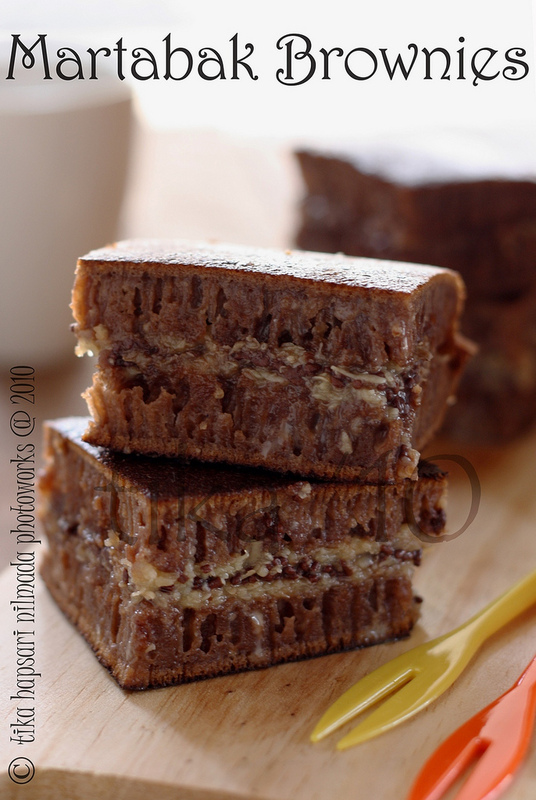 Martabak Brownies is a modification of sweet martabak. Chocolate was added to the batter and makes the chocolatey thick pancake. 1. Sift flour, chocolate powder and baking powder to make sure there are no lumps. Set aside. 2. Mixed the milk and instant yeast, stir evenly. Set aside. 3. Melt the butter and the chocolate and mix until smooth. 4. Beat the eggs and sugar until you have a silky consistency. Add alternately another half portion of sifted flour with milk. Beat until combine. 5. Add the melted chocolate, stir evenly Rest the batter for 30 minutes in room temperature. 6. Heat the pan over medium heat. Pour in the batter till it reaches about half the height of the pan. 7. Cook over small heat, when bubbles starts to form sprinkle sugar. (bubbles indicate that the martabak consists pores). Cover the pan, let it cook until set. Then take it out of the pan. 8. 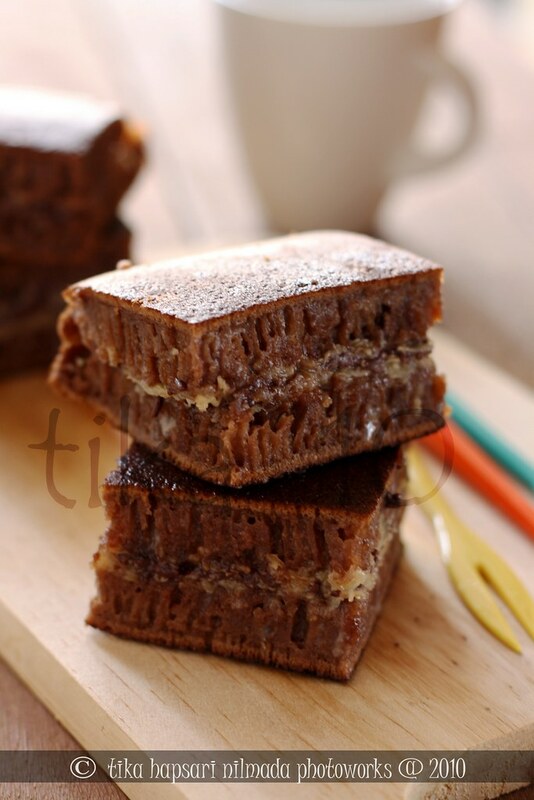 Spread martabak with butter, sprinkle with chopped dark cooking chocolate and grated cheese. Pour condensed milk over the martabak. 9. Cut into half and put one half on top the other half. Spread with butter for the last time. Cut as desire. 1. Ayak tepung terigu, coklat bubuk dan baking powder hingga rata. Sisihkan. Campur ragi instan dan susu, ratakan. Sisihkan. 2. Campur margarin dan dark cooking chocolate, masak hingga coklat larut. Sisihkan. 3. Kocok telur dan gula hingga mengembang. 4. Tambahkan campuran terigu perlahan bergantian dengan susu sambil diaduk hingga rata. 5. 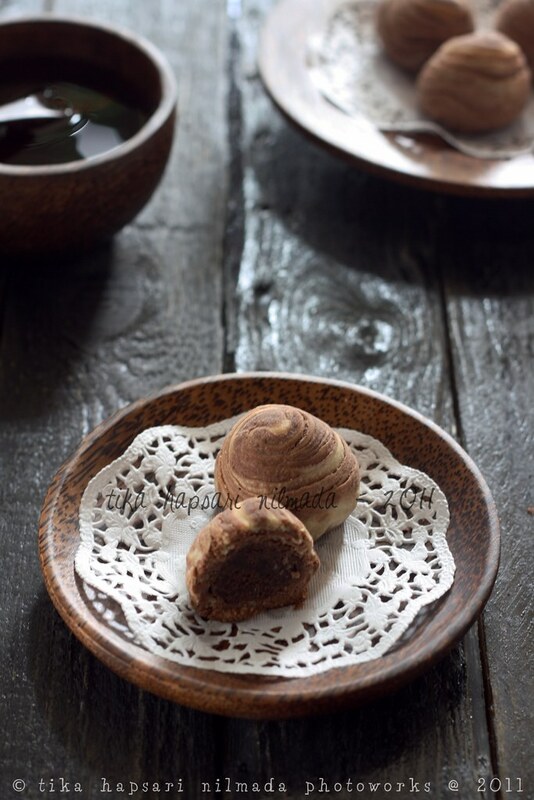 Tuang campuran coklat perlahan, ratakan. Diamkan adonan selama 30 menit. 6. Panaskan cetakan, tuang adonan hingga 1/2 tinggi cetakan. 7. Panggang hingga berpori, taburi dengan gula pasir. Tutup cetakan, masak hingga matang. Angkat. 8. Olesi margarin, taburi dengan coklat dan keju parut. Beri tambahan susu kental manis. 9. Potong menjadi dua bagian sama rata, lipat martabak, olesi kulit dengan mentega. Potong dan sajikan. Tips : Pastikan cetakan panas pada saat adonan dituang. Karena cetakan yang tidak panas akan menyebabkan martabak tidak berserat. Yong Tau Fu Restaurant in Jakarta, Indonesia. My entry for Black & White Wednesday hosted by Susan from The Well Seasoned Cook. 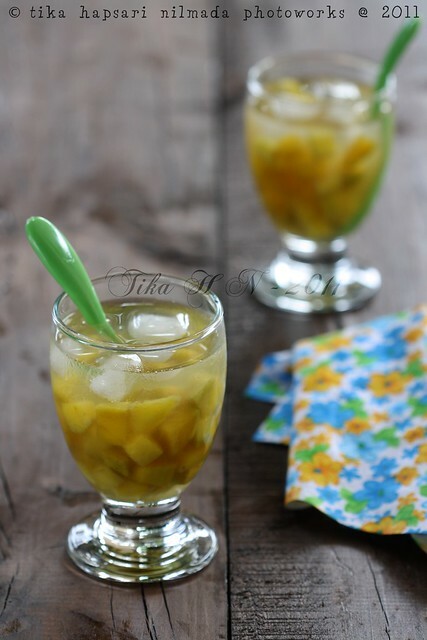 This Horse mango sorbet is one of Indonesian traditional dessert from Madiun, East Java. I know I'm not a sorbet kind of person. But this sorbet is not like any other sorbets you've known (I mean in presentation !). You don't need to make puree from this fruit and also you don't need to freeze it in the fridge before being served. 1. Cut the horse mangoes into small cubes. Set aside. 2. In a sauce pan, boil water, salt and sugar still evenly until sugar dissolved. Remove from the heat. Add the horse mango cubes if the water is warm enough. Allow it to cool. 3. Serve with shredded ice. - 3 buah (400 gr) mangga kweni, kupas dan pisahkan dari biji. 1. Potong-potong kecil mangga kweni. Sisihkan. 2. Rebus air, garam dan gula pasir sambil diaduk sampai gula larut. Biarkan hangat. 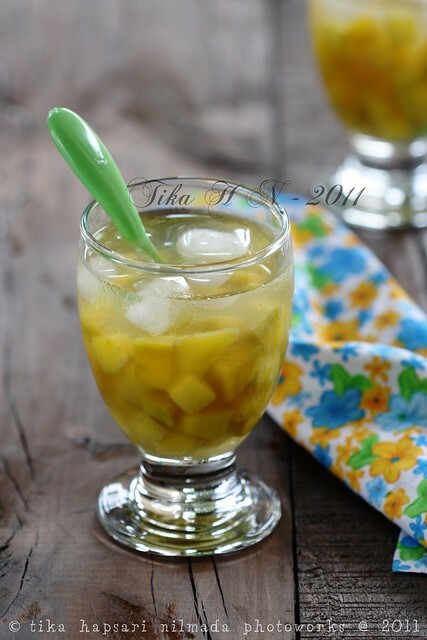 Masukkan mangga. Biarkan dingin. 3. Sajikan dengan es serut. Do you know how foodie bloggers treat their friends from around the world ? You could invite them to write guest post on your blog, then they will cook tasty foods in their own kitchen especially for you, they will spend their most valuable time to take photographs of the foods and finally they will write the post as if it will be up on their own blog. One thing, they will do it all for the love of friendship ! My fourth guest post is for Xiaolu Hu from 6 Bittersweets, a sweet lady who has so many friends from around the world. Lucky to know her as foodie friend, because everything about her is loveable ! 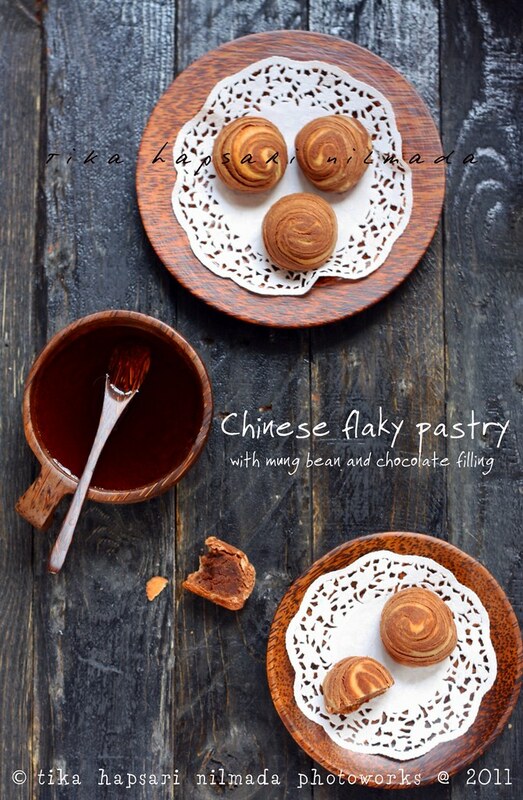 She's also a fantastically baker and food photographer, which you already know if you are a reader of her blog. She always comes up with creative ideas with food. Spools of thread cake pops, Cookies n' cream owl cupcakes, Lemon macarons in such cute shape :D , S'mores cupcakes are some of delicious foods you can find in her blog. My second attempt on Chinese flaky pastry went perfectly well. I found the right technique to show the layers on the outside. And I also made these in smaller size. Cute. :D I invite you all to come and view the full recipe at 6 Bittersweet where it posted as guest post over her blog.